Location of Movico in Mobile County, Alabama. 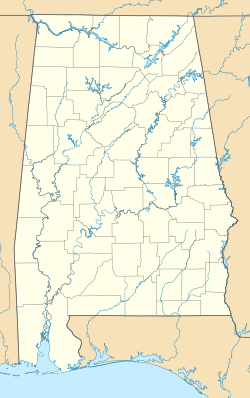 Movico is a census-designated place and unincorporated community in Mobile County, Alabama, United States. Its population was 305 as of the 2010 census. Residents are zoned to Mobile County Public School System campuses. Residents are zoned to Citronelle High School. The community was formerly in the attendance boundary of the Belsaw/Mr. Vernon K-8 school in Mount Vernon, which closed in 2016. ^ "Movico". Geographic Names Information System. United States Geological Survey. ^ "2010 CENSUS - CENSUS BLOCK MAP: Movico CDP, AL." U.S. Census Bureau. Retrieved on November 27, 2018. ^ Devoe, Emily (2016-05-24). "Mobile County School Board Votes to Close Two Schools". WKRG. Retrieved 2018-11-27. This page was last edited on 28 March 2019, at 17:04 (UTC).